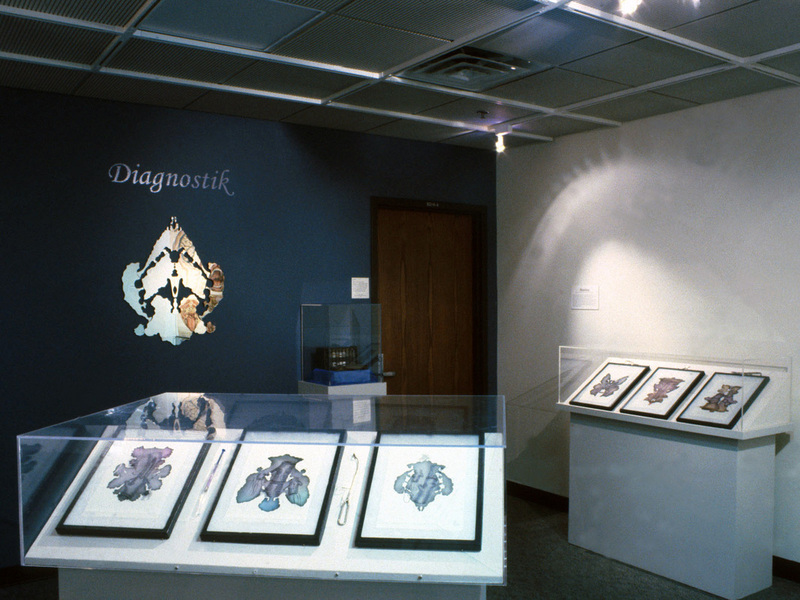 Diagnostik is an installation that draws content from the collections of the University of Iowa Medical Museum and utilizes museum artifacts, photographs and textual materials to assemble an aesthetic and critical response to the history of mental health care. Through the medium of art, Diagnostik strives to provoke contemplation and dialogue around the perceptions of the mentally ill and the dignity of the individual patient. The University of Iowa Hospitals and Clinics Medical Museum's permanent collection is comprised of over 5,000 artifacts, hundreds of photographs, a research archive and other documentation such as original patient records. These materials resonate with the social, cultural and ethical climate of their time, providing a rich resource for study and research. These works combine drawings based upon early 20th century illustrations of surgical procedures, and pigmented stains—reminiscent of Rorschach's Inkblot test images on translucent cloth. The cloth has an iridescent quality that subtlety obscures the drawing except in areas where ink has been applied. The ink neutralizes the refractive quality of the cloth and creates a visual opening through which the drawing beneath is more clearly revealed. In 1921, Swiss physician Hermann Rorschach published Psychodiagnostik, the now famous Inkblot test. Rorschach was an amateur artist who first began to explore the potential of using a visual approach to psychological evaluation and diagnosis while working in an adolescent psychiatric ward. The Iowa State Psychopathic Hospital moved to a new state-of-the-art facility in 1921. An association is drawn between these two events to acknowledge the emphasis placed on devising scientific approaches to treating mental illness in Iowa and elsewhere at this time. The Hospital exemplified a shift away from the custodial asylum toward research, treatment and prevention. The word mandala is Sanskrit for circle. It is a symbolic diagram, representing the universe, that is used as an instrument of meditation in Buddhist Tantrism. Swiss psychiatrist Carl Gustav Jung (1875-1961) believed that drawing quaternary images (including mandalas) in therapy can be used to create a sacred, protected psychological space. As such, it can serve as a medium for healing. These works are based on images of the Iowa State Psychopathic Hospital and related University Hospital and research departments. They assimilate the visual symmetry of the mandala and the provocative qualities of the Rorschach inkblot test. Like inkblots, these images suggest perceptual associations—angels, torsos, spacecraft—that go beyond their photographic source material. What do you see? This work presents historic information about mental illness drawn from research collections, literature and other references. Some of the positions represented reflect attitudes and ideas influenced by moral and cultural biases that would not be acceptable today. They are included here as part of a historical record. 15 example images are presented here. See the image gallery to see installation views and additional works of art.